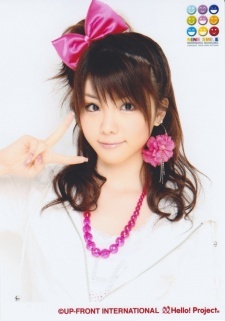 Reina Tanaka (田中 れいな, real name 田中 麗奈, born November 11, 1989 in Fukuoka Prefecture, Japan) is one of the sixth generation members of the J-pop group Morning Musume. Her professional first name is spelled in hiragana to differ her from the Japanese actress Rena Tanaka whose name is the same in kanji because their first names can be pronounced both as "Reina" and "Rena" and who is similarly from Fukuoka Prefecture. # Hobbies: People-watching. I record a lot of TV shows from Monday to Friday, so I watch them in the mornings. # Habits: "I clap my hands when I laugh..."
# Motto: If you're allowed to be yourself, you won't do bad things to people!